Artificial intelligence is like the hot new gadget of any Christmas season – everybody wants it because it’s cool, but they likely don’t know how to use it. In the same vein, marketing and sales professionals want to infuse their tech stack with AI because it’s the new hot technology, but they’re not sure how to get started, or how it will actually impact their pipeline. 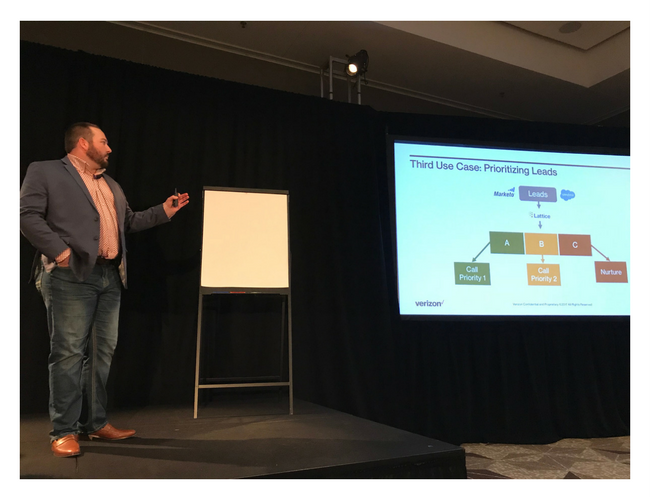 Cunningham and Silver also provided a number of different examples of how AI platforms enhance various sales actions - like resource allocation, forecasting and cross-sell/upsell - by infusing them with data. At the end of the day, no matter what AI platform a company chooses for their sales activities the key is to make sure that it creates plays that are better, faster and more automatic. 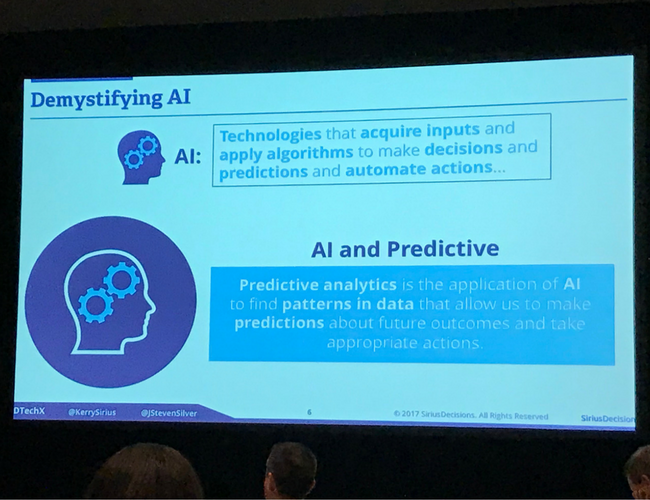 While the SiriusDecisions team did a great job of highlighting how the sales organization can benefit from predictive AI platforms, our customer Verizon Enterprise Solutions gave real-world examples of how both sales and marketing teams benefit from predictive analytics. 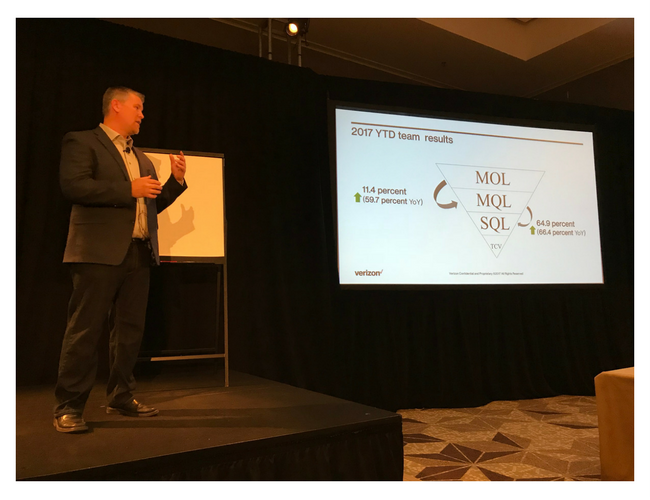 Brian Shaner, Director of Global Demand Generation, took over the demand generation team two years ago and realized he needed to transform it into a more data-driven organization, because the leads they were passing to sales were unusable. In order to do this Shaner and his team completely revamped their processes, people and technology stack. He brought on a BDR team, replaced an aging marketing automation platform with Marketo, and deployed Lattice Engines to enable his team to capture and analyze the intent and behavior of their leads and accounts, not just firmographic details. Once his team had gone through this transformation they realized they could impact all stages of the revenue funnel with their new approach. Predictive models from Lattice help them prioritize the top 5% of accounts for sales reps to focus on, to further improve their account-focused activities. For those reps focused on cross-sell, teams now have models showing what other similar accounts are buying, which helps contextualize their conversations. For the lead-based campaigns, the team realized they could use Lattice for many of the projects that the BDR team is focused on. For example, Senior Business Development Manager David Zahner’s team is in charge of following up with all the scanned leads from trade shows. Previously he would have his team of three calling on hundreds of scanned attendees, hoping that a few would turn into marketing qualified leads (MQLs). Now with Lattice, Zahner can run the list of leads through a predictive model, and prioritize those highly scored leads that are actually worth calling on. This means his team can apply more touches to key targets, rather than just one or two touches to the entire list. Since Shaner got his new team and tech stack up and running, he’s seen some amazing results. His team has seen a 60% year-over-year increase in marketing owned leads (MOLs) that convert to MQLs. But even more impressive is the conversion rate of their MQLs – they’ve seen a 66% lift in the number of conversions over the past year. As AI platforms like Lattice continue to grow in sophistication it’ll be exciting to see what companies like Verizon Enterprise Solusions can do to completely transform their revenue engines. And if you’re interested in talking to someone about doing the same for your company, contact us here!